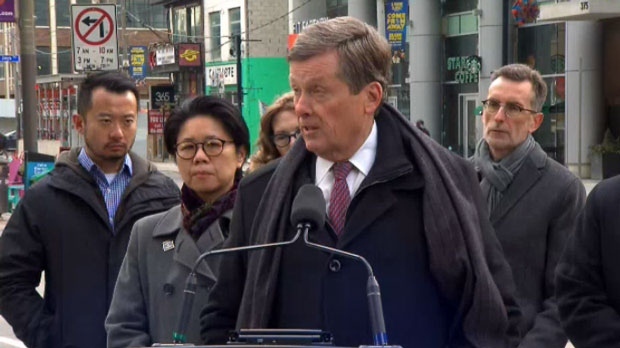 Mayor John Tory says he will support a staff recommendation to make the King Street Pilot permanent, likening it to a “surface subway” that was created “in the span of a weekend” at little cost to taxpayers. The King Street Pilot, which gives streetcars priority use of King Street between Bathurst and Jarvis streets, was launched in November, 2017 as an innovative way to speed up public transit in the area. As part of the pilot project, about 180 on-street parking spaces along King Street were removed and through traffic was largely prohibited, drawing the ire of some drivers. At the same time, the pilot project resulted in a boost in ridership on the King streetcar, one that staff attribute to an improvement in commute times and increase in service reliability. According to data provided by the city, the average weekday ridership on the King streetcar has increased from 72,000 to 84,000 since the pilot began. The data also suggests that streetcar travel times have improved in every time period with the exception of late Thursday, Friday and Saturday nights. The staff report says that the biggest impact on travel times is during afternoon rush hour when the slowest streetcars travel through the pilot area four to five minutes quicker than before. During the morning rush hour, the staff report says that commute times are similar despite a 20 per cent increase in ridership. All told, the staff report estimates that commuters on the King streetcar are saving a combined 30,000 minutes every weekday as a result of the pilot. The King Street Pilot has not been without controversy. Since its launch, numerous restaurants in the city’s theatre district have complained about a decline in business that they say is the result of their establishments being more difficult to access. The staff report does reveal that spending in restaurants along King Street declined by 1.2 per cent in the one-year period following the start of the pilot project when compared to the preceding year. The report, however, points out that spending in the retail and services sector was up 1.7 per cent in the pilot area, effectively offsetting the drop in spending at restaurants. The report also shows that the rate of cancelled business licenses within the King Street pilot area increased by 1.5 per cent in 2018, which was lower than the rate observed in the surrounding area and city-wide. During the pilot project, the city created 19 temporary public spaces along the curb lane on King Street and the staff report recommends spending $1.5 million on making many of those spaces permanent, as well as improving the infrastructure at streetcar stops. The staff report also says that 14 businesses have expressed interest in operating on-street cafes along the street this summer. Speaking with reporters near a streetcar stop at King Street and Charlotte Street, Tory said that he is committed to “further increasing amenities along the street” and making sure that King continues to be “a magnet” for residents and tourists. “Things were very challenging in the early days of the pilot with cold weather, dark theatres and changed circumstances but the same data indicated some rebound and stabilization,” he said. Toronto Mayor John Tory speaks at a news conference on April 2, 2019.